When the 2016 New England Patriots designed their Super Bowl ring, the put in a record setting 243 diamonds to represent the 24-3 deficit they overcame to win. Today we’re getting a look at the ring designed for the Super Bowl LII winning Philadelphia Eagles. And they put their own significance into the gem count. 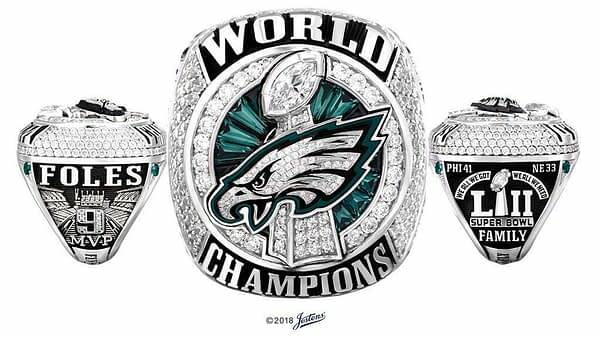 According to ESPN, there is a waterfall of 127 diamonds on the bezel of the ring representing the “Philly Special”, the count being the total sum of the jersey numbers of the three players who handled the ball post-snap: Nick Foles #9, Corey Clement #30 and Trey Burton #88. The ring is pure 10-karat white gold with a total of 219 diamonds and 17 green sapphire. They also included the the team slogan of “We All We Got, We All We Need” and the word “Family” on the side of the ring. There is also said to be an underdog mask on the inside. The team got together at a private event which brought back all the players and coaches for one night. Players were giving their rings one-by-one with a highlight video of their season playing as the walked up to the stage to receive their ring from team owner Jeffrey Lurie. Head Coach Doug Pederson believes, now that the rings have been passed out, the team can put last year behind them and focus on 2018.